New York's representation in Washington, D.C. has shrunk along with its population. CITY HALL — New York will have two fewer Representatives in Congress when it convenes in 2013, according to the latest Census count released Tuesday. New York will now have 27 seats in the House, down from the current 29, the U.S. Census Bureau announced, prompting what is sure to be a long and heated battle over where the new district lines are drawn. Every ten years, Census data is used to reshuffle Congressional seats so they reflect the most current state population counts. 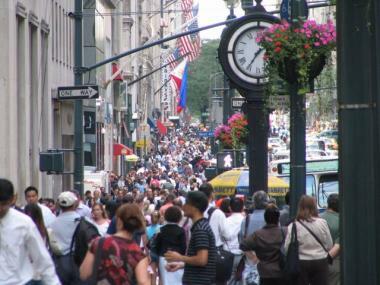 New York’s population did grow, from 18,976,457 people in 2000 to 19,378,102 in 2010. But that 2.1 percent growth rate just wasn't enough to keep up with other states, like Texas, Idaho and Utah, whose growth topped 20 percent. Mayor Michael Bloomberg said the results were disappointing. "It's not good for New York. We’ll have less representation in Washington," he said, adding that he hoped the count would be "a wake-up call" for leaders in Albany to do more to attract people to the state. This is the seventh census cycle in a row in which New York has lost seats. Ohio, Pennsylvania, New Jersey, Missouri, Michigan, Massachusetts, Louisiana, Iowa and Illinois also lost seats along with New York. Overall, the Census revealed that the U.S. population on April 1 was 308,745,538, up about 10 percent since 2000. Detailed information about precisely how the population has shifted within the state won't be released until February or March, said Kimball Brace, president of Election Data Services, a political consulting firm specializing in census data analysis. But the squabbling over redistricting has already begun. Less than two hours after the results were announced, Senate Democratic conference Leader John Sampson and State Sen. Martin Malavé Dilan released a statement lashing out at Senate Republicans and accusing incoming Senate Majority Leader Dean Skelos of breaking a pledge to pursue nonpartisan redistricting. "Senators truly committed to reform should support both an independent redistricting process and new district lines," he said, adding that the non-competitive elections created by partisan line-drawing are "the main source of Albany’s dysfunction." Skelos spokesman Scott Reif denied the charge and said the leader's position has not changed. During the election, Skelos signed a pledge to support former Mayor Ed Koch's "New York Uprising," a Political Action Committee that is calling for nonpartisan redistricting, among other reforms. But if anyone thinks the squabbles will stay update, Queens College's Andrew A. Beveridge, said think again. The sociologist, who specializes in demographics, said that if the state had only lost one seat, the city would likely be spared from the debate, since so much of the state's population loss was expected upstate. But with two seats lost, he warned residents to brace themselves for complication, since districts from north to south will likely need to be redrawn larger to make up for the loss. "The redistricting is going to be a big brouhaha," he said.